Fannie Mae reported Friday that the Single-Family Serious Delinquency rate declined in December to 2.38% from 2.44% in November. The serious delinquency rate is down from 3.29% in December 2012, and this is the lowest level since November 2008. Last week, Freddie Mac reported that the Single-Family serious delinquency rate declined in December to 2.39% from 2.43% in November. Freddie’s rate is down from 3.25% in December 2012, and is at the lowest level since February 2009. 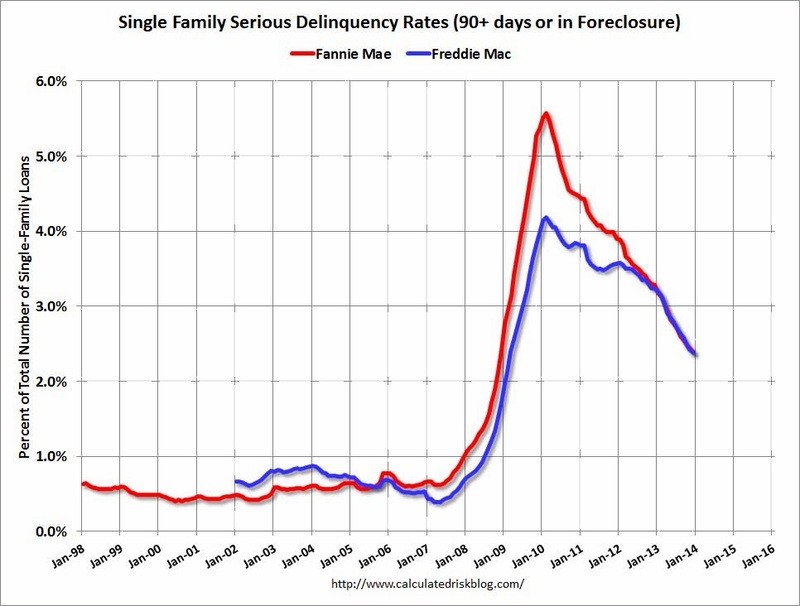 Freddie’s serious delinquency rate peaked in February 2010 at 4.20%. Note: These are mortgage loans that are “three monthly payments or more past due or in foreclosure”. The Fannie Mae serious delinquency rate has fallen 0.91 percentage points over the last year, and at that pace the serious delinquency rate will be under 1% in about eighteen months. 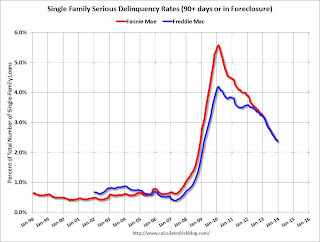 Note: The “normal” serious delinquency rate is under 1%.